Most straight-end styles can come with 18mm, 19mm or 20mm ends. 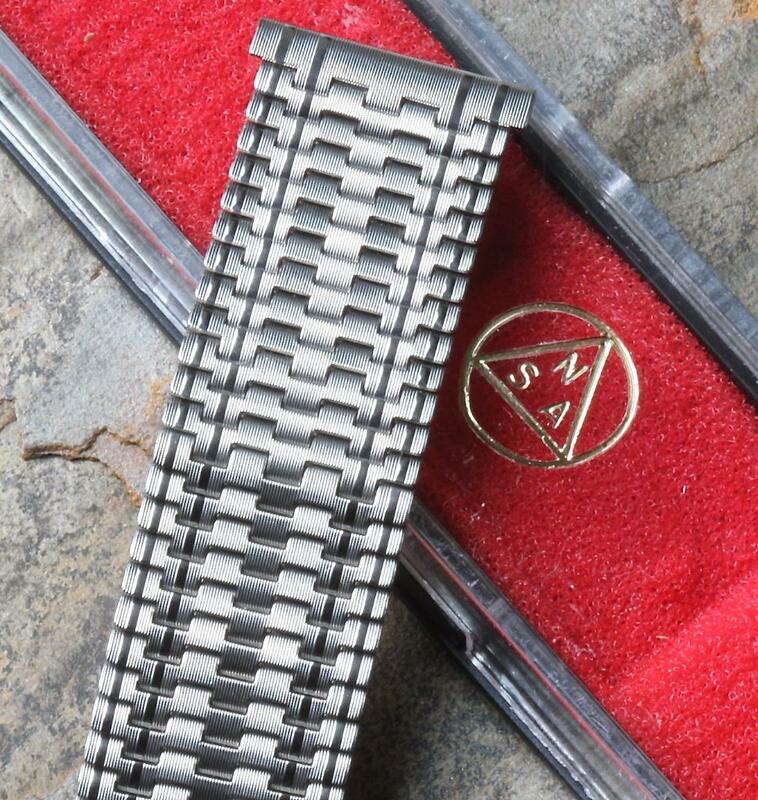 I've also added rare NSA bands with 18mm curved ends. PLEASE NOTE no NSA box is included with the bracelets in this CT discounted offer. BUY A FEW AND SAVE: If you buy 2 or more bracelets, each bracelet will be discounted by 15%. 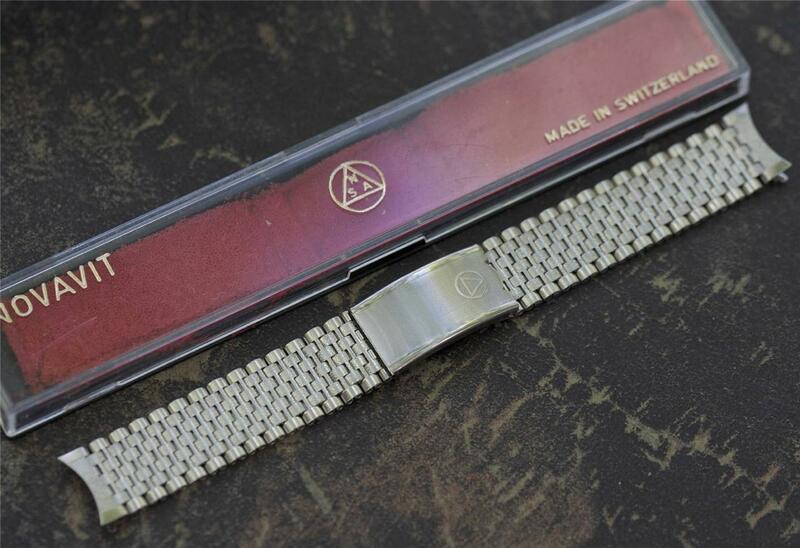 Here is a chance to fit your favorite watches with New Old Stock vintage bracelets from Switzerland’s NSA, the original manufacturer of bracelets for many famous major watch brands. 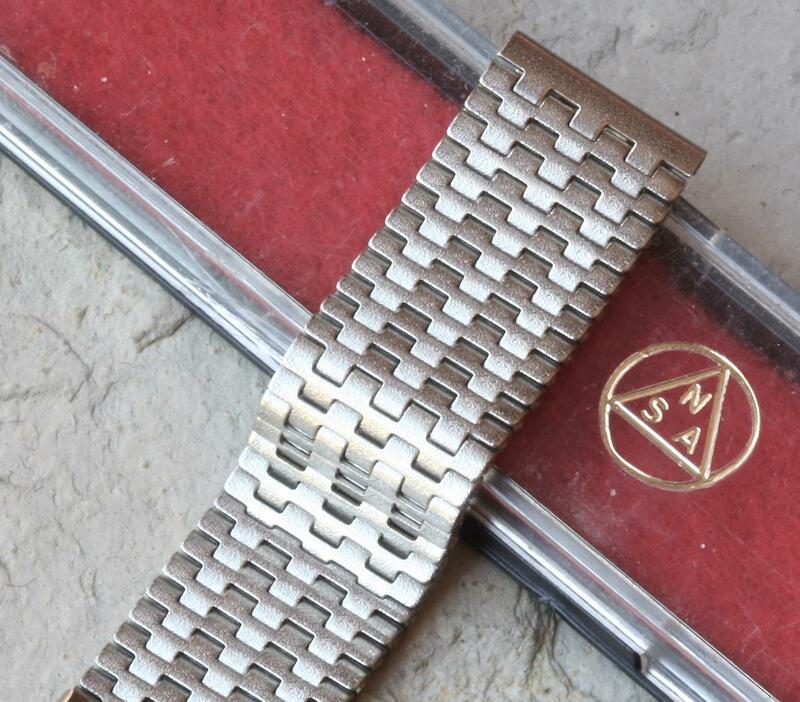 Need a specific brand NSA bracelet or just extra links, clasp springs or end pieces? Email me at billmahoney@aol.com or check my inventory at Squinky.com as new NSA Swiss band offerings are added most weeks. 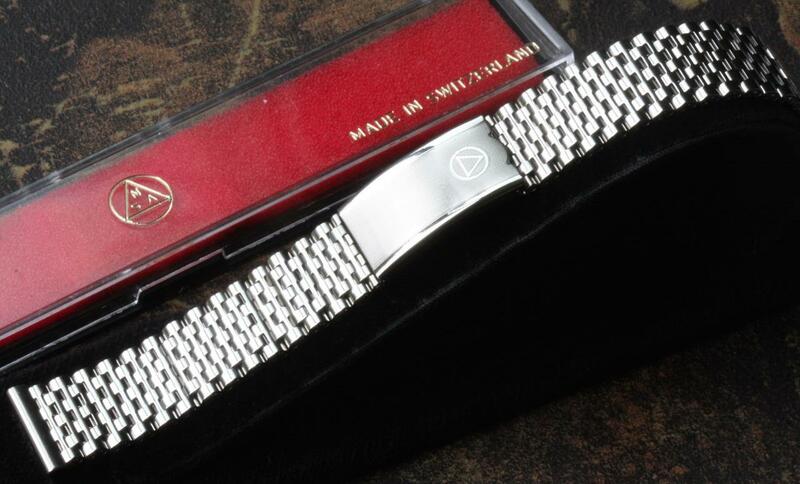 SPECIAL DESIGN FEATURES: All NSA men’s bands are 6 inches long (unless noted otherwise in the description). NSA makes a rare design: Every link is removable with a simple nail type link pin enabling any NSA band to be adjusted easily to any length. 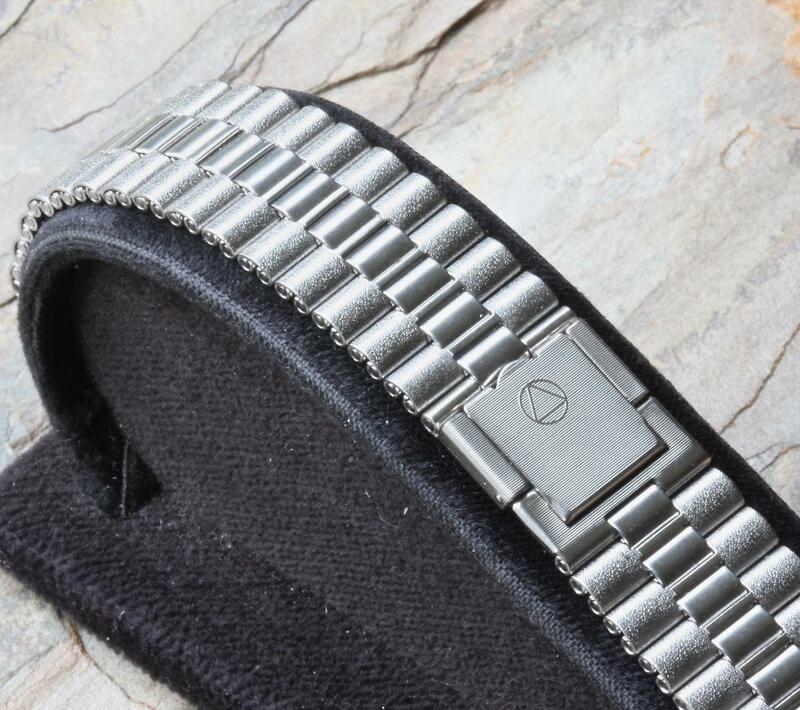 Plus, NSA bracelets have special “spring-loaded” comfort clasps meant to flex 1/8 inch as you wear them for perfect comfort. 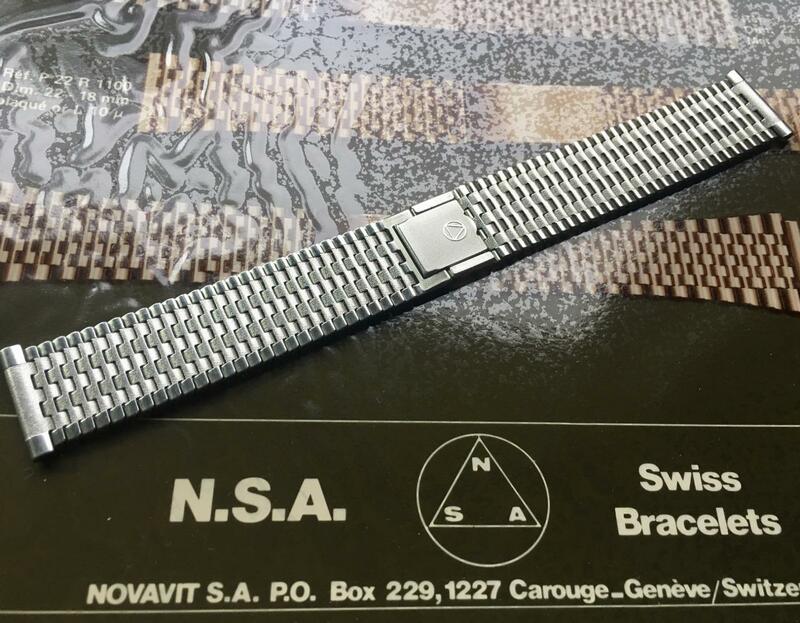 HISTORY OF NSA SWITZERLAND: Also known as Novavit S.A., NSA made the bracelets on many models of the most collected brands in the 1960s through the early 1990s. The company closed down 25 years ago and the stock is disappearing quickly. 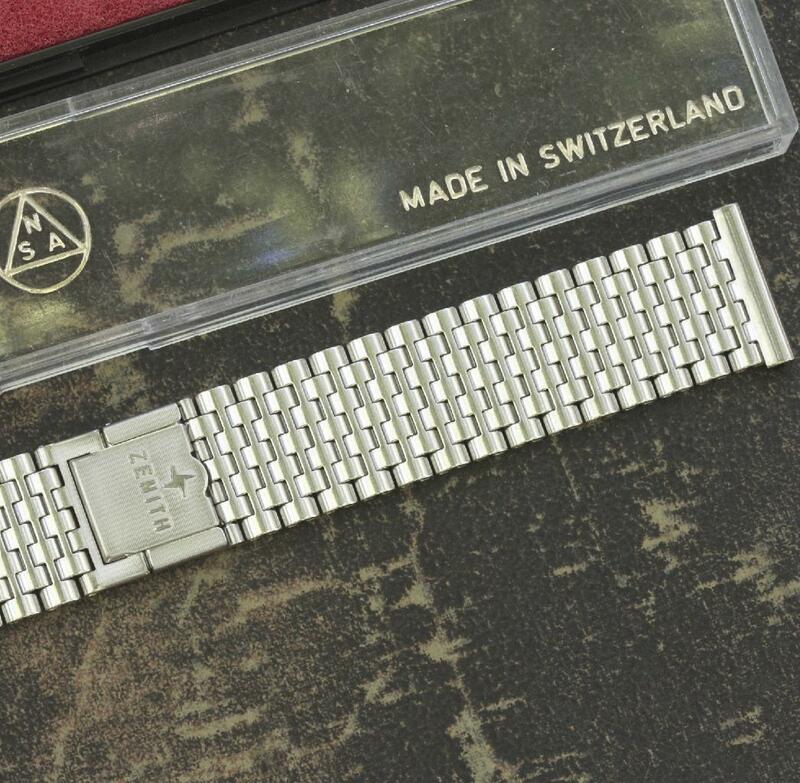 These bracelets originally came on brands such as Heuer, Breitling, Doxa, Jaeger-Lecoultre, Favre-Leuba, Aquastar, Zenith, Hamilton, Eterna, Zodiac, Fortis, Rado, Roamer, Certina and many others. 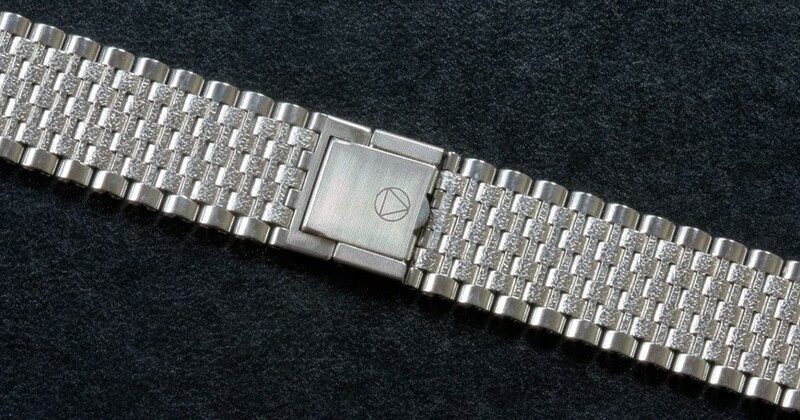 You will see these same bracelets on many famous watch models bearing the logos of Heuer, Breitling, Zodiac, Rado and Zenith --- companies that just added their logo to the clasp. ALL PRICES INCLUDE FREE U.S. SHIPPING WITH DELIVERY CONFIRMATION. MOST ORDERS SHIP THE NEXT BUSINESS DAY. Stunning band using alternating smooth polished beads links and dark finish links that are 18mm straight across. Straight end pieces available in 18mm, 19mm, 20mm. Curved end pieces in 18mm. 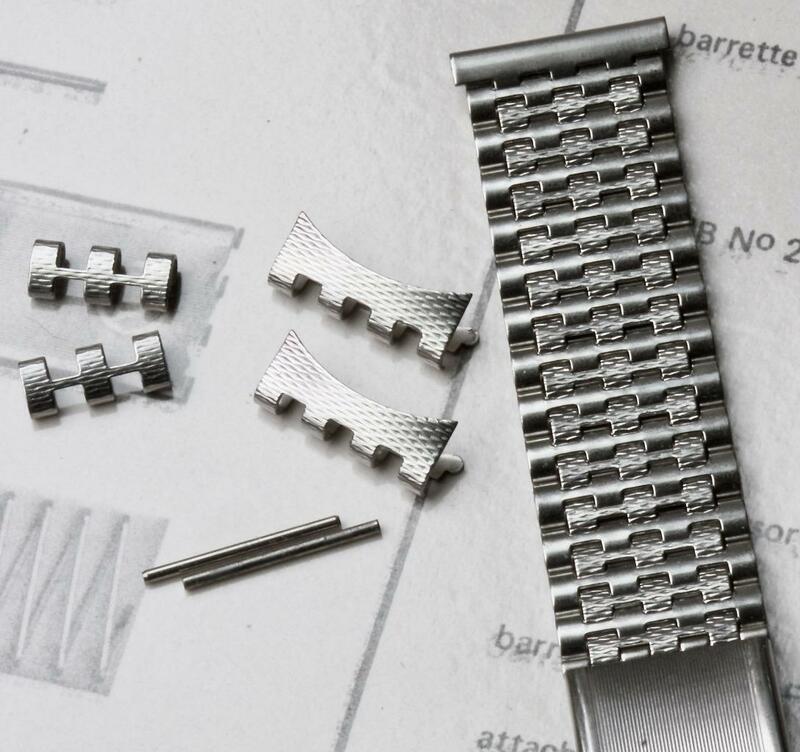 Perfect for satin finish watches. 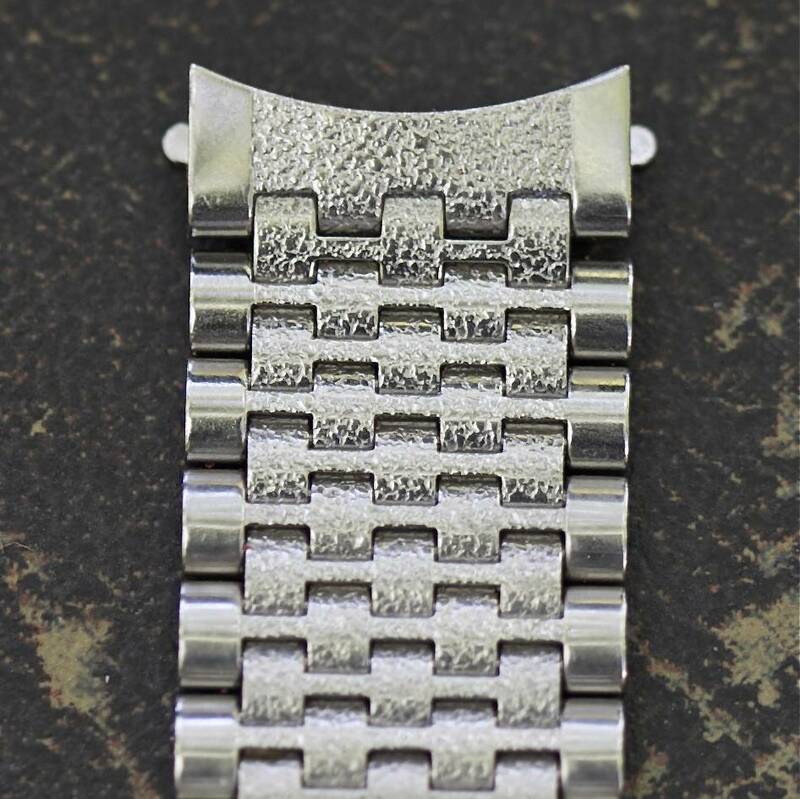 Brushed finish stainless steel links pattern works with many different types of watch styles. Comes with 18mm, 19mm or 20mm straight ends. 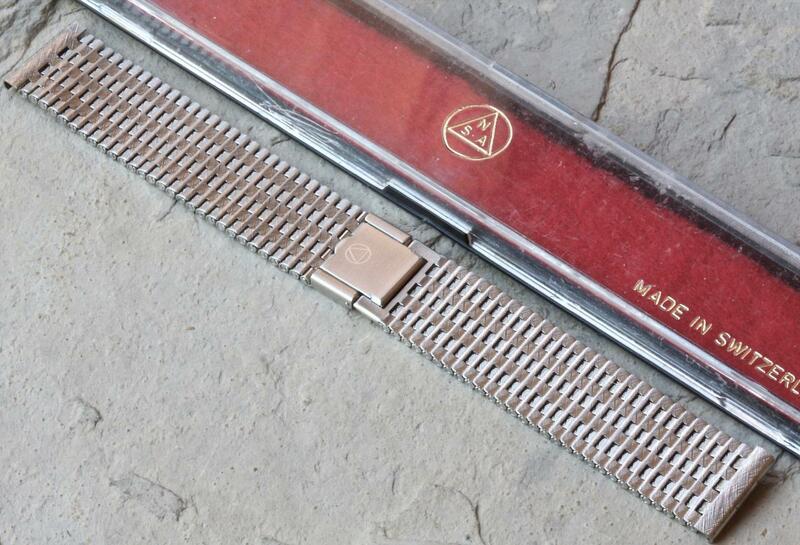 Also available with a 2-piece, square clasp. Long Version measuring 7 1/2 inches is $350. Fantastic pattern carried over on the ends. Can come with straight ends in sizes 18mm, 19mm or 20mm. Also available with 2-pc square clasp. A popular NSA style with quite a distinct pattern followed through on the curved ends. 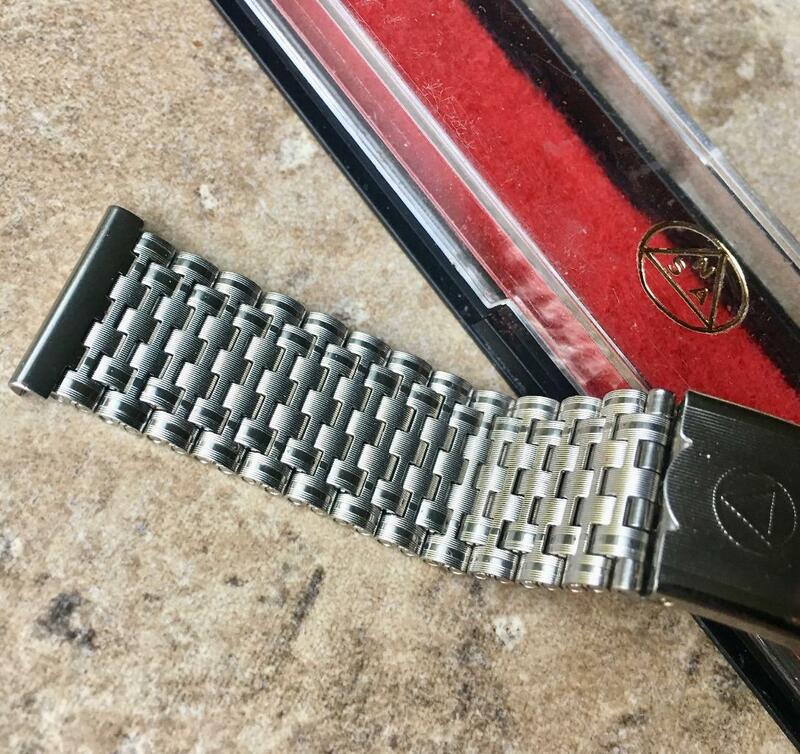 Perfect for polished or satin finish watches because both styles are incorporated in this band. Can also come with straight polished smooth ends in sizes 18mm, 19mm or 20mm. 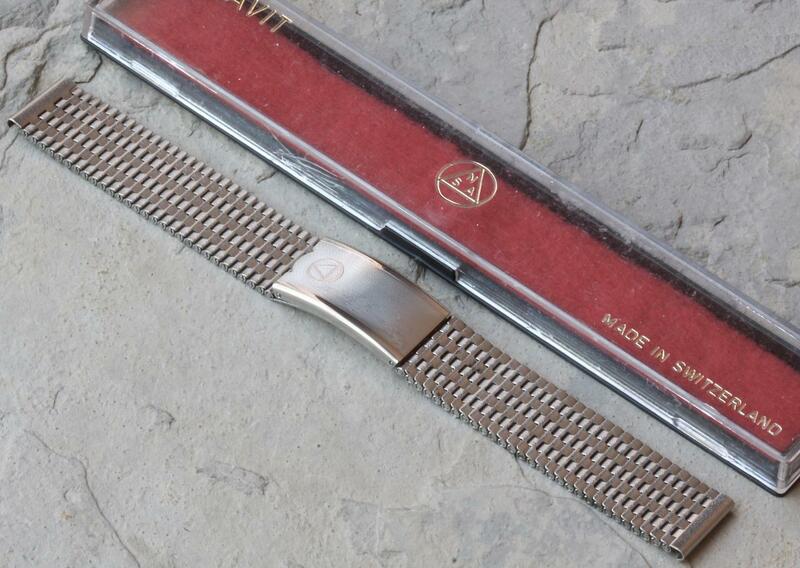 You can also get this band with the standard, long flip-over clasp. 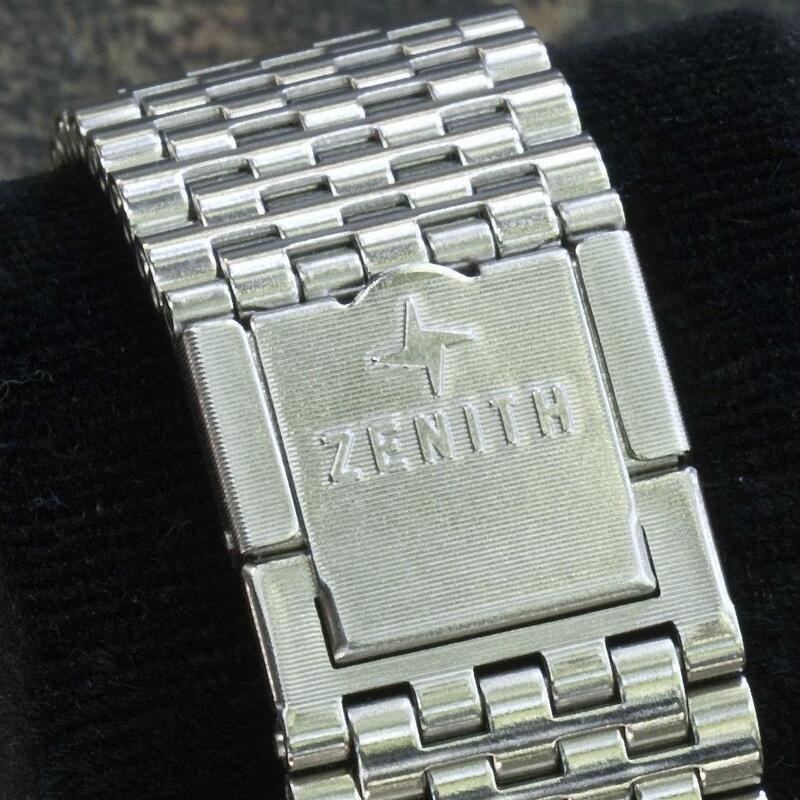 Very popular Zenith NSA band can be used for El Primero or Defy models. Comes with 18mm, 19mm or 20mm straight ends. 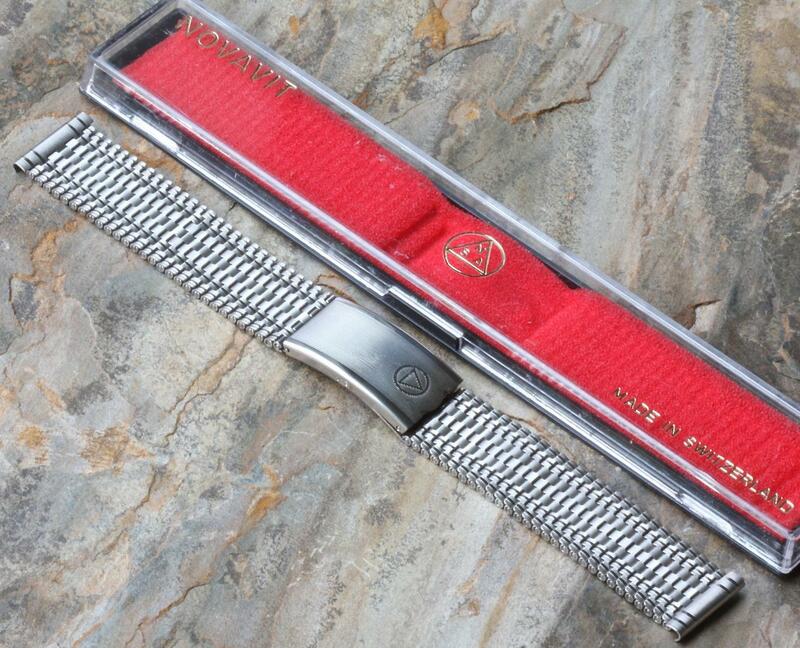 One of the few NSA bands that can come with 18mm wide curved ends. 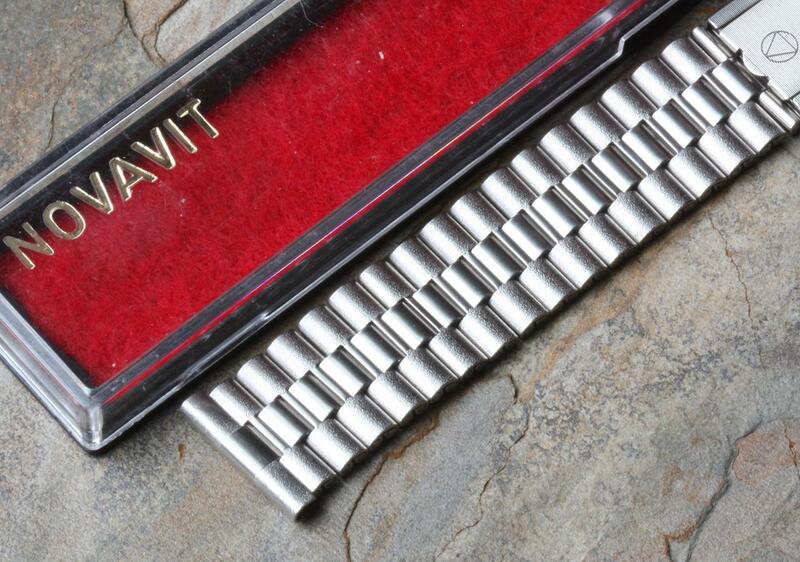 Special combination of textured inner rows bordered with outer high-polished accent rows. Can also come with straight ends in 18mm, 19mm or 20mm wide. 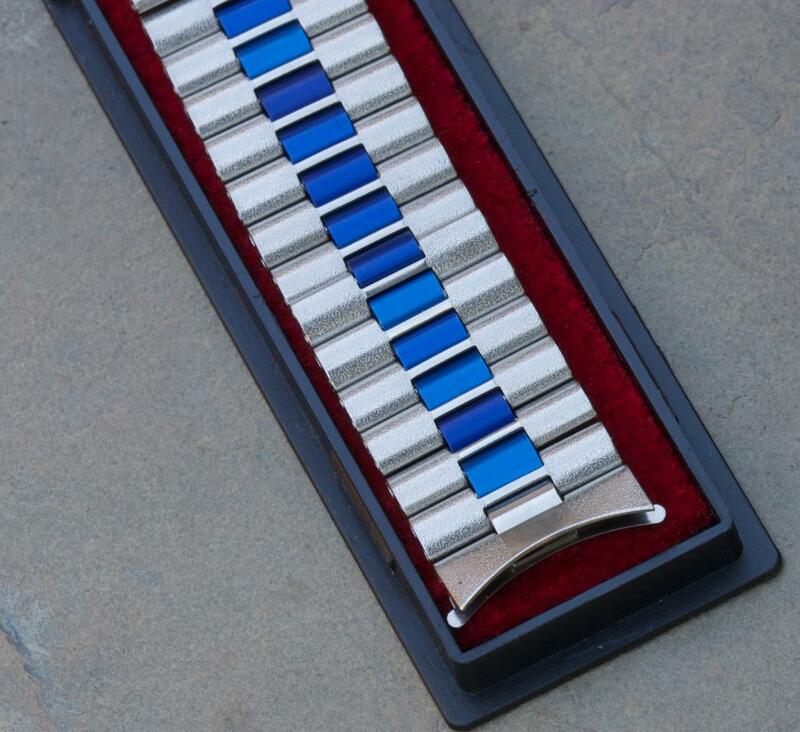 Also available with a standard long deployant clasp. 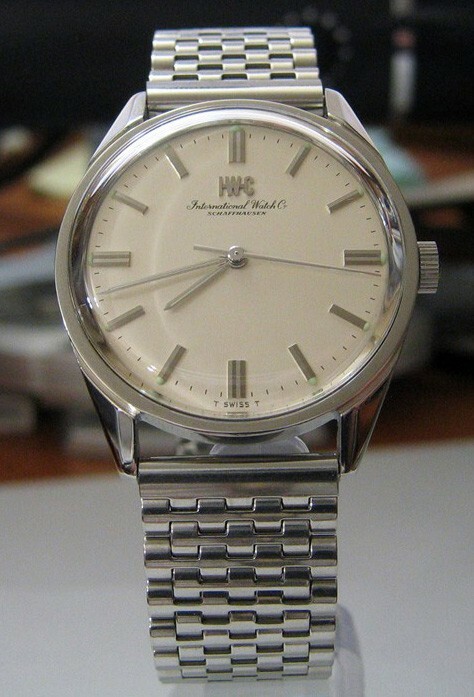 Flexible link polished steel “beads” style that suits many watches, from the largest dives to chronos or dress watches like the IWC below. Standard flip-lock deployant clasp. Comes with straight 18mm, 19mm or 20mm ends. 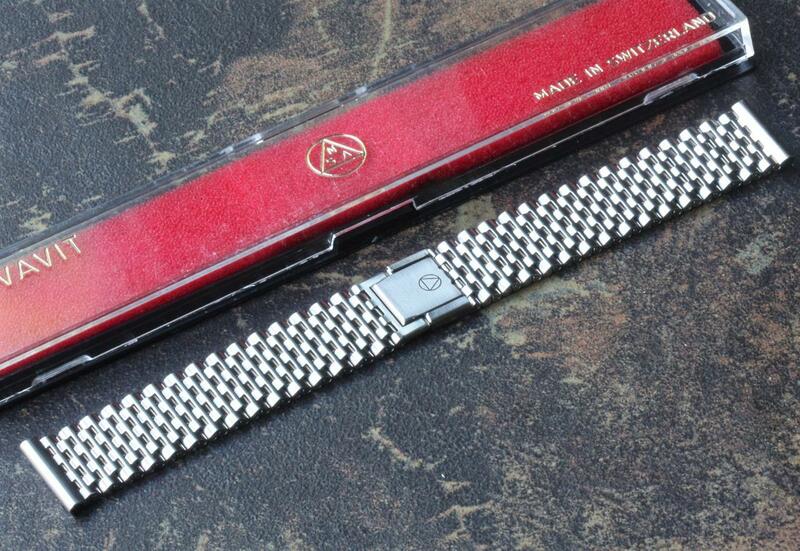 This Long version of the band above is a full 7 1/2 inches long (19.2cm) to fit any wrist size. Standard flip-lock deployant clasp. Comes with straight 18mm, 19mm or 20mm ends. 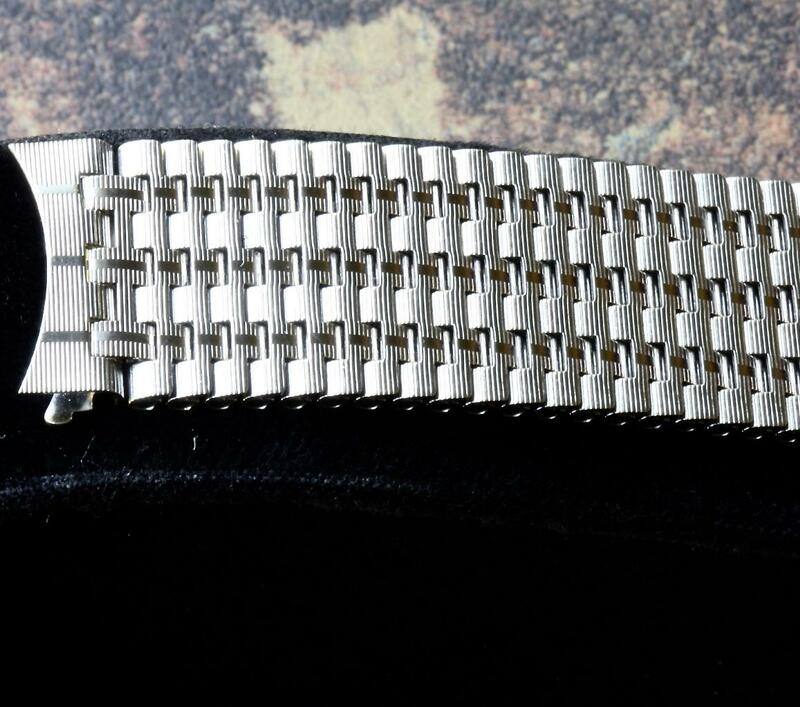 Steel bracelet with matte finish links with a sliding clasp that allows the bracelet to go from 4 1/2 inches to 7 1/8 inches long to fit many different size wrists. 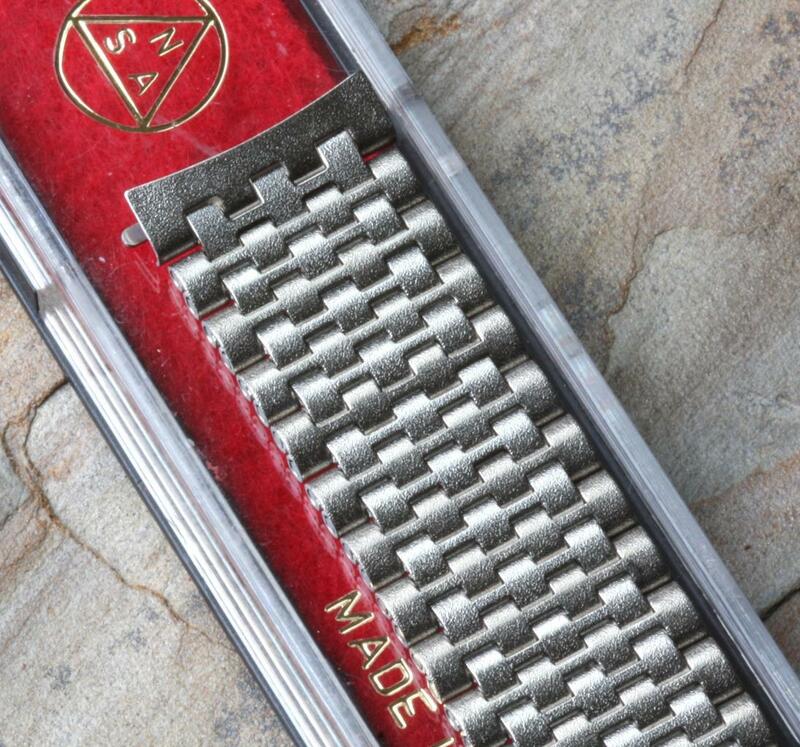 Comes with 18mm straight ends that can also be opened to fit over solid fixed lugs. 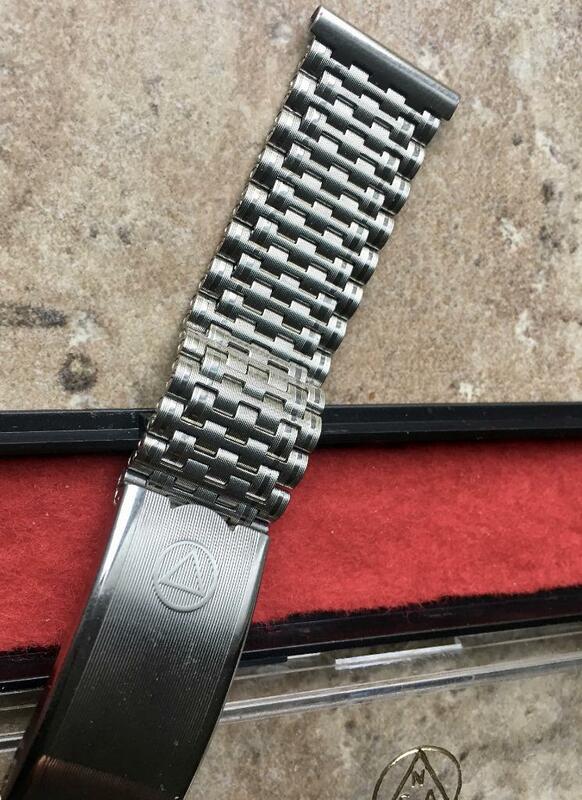 Bargain price of $75 for an NSA band! 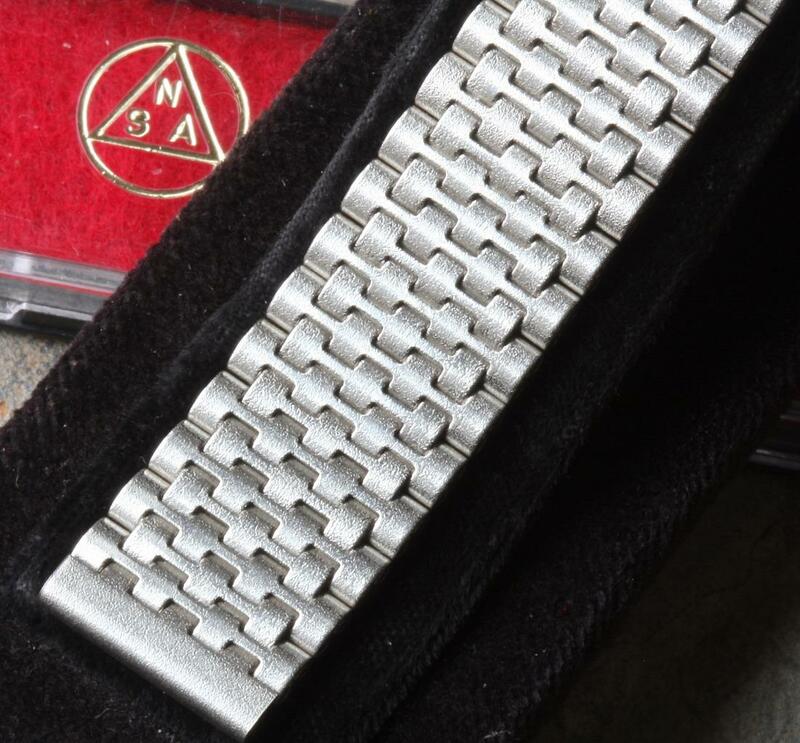 This band has textured outer links with black center links. Can come with straight ends that are 18mm, 19mm or 20mm, or the 18mm wide curved ends shown. Also available with a standard, long clasp. 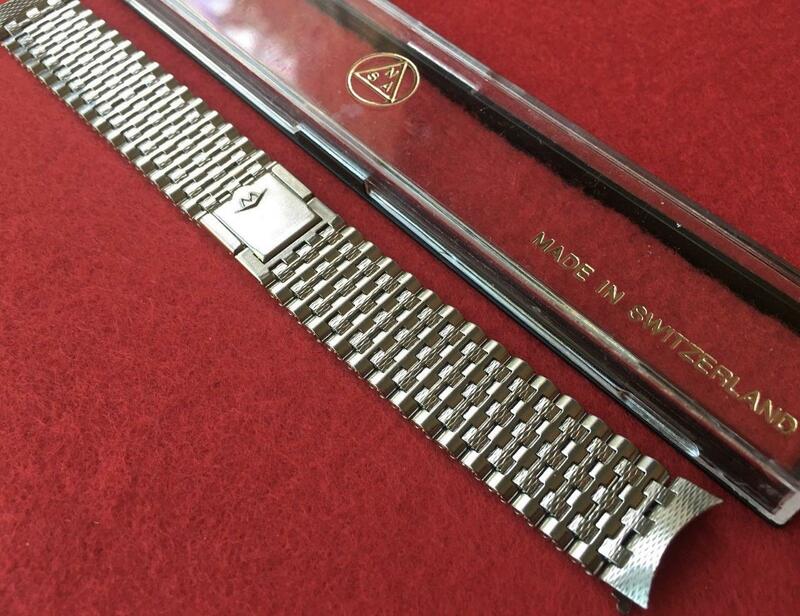 The NSA model Heuer and Jaeger-Lecoultre put on many watches.This steel bracelet has three rows of curved links with polished center links and brushed outers. 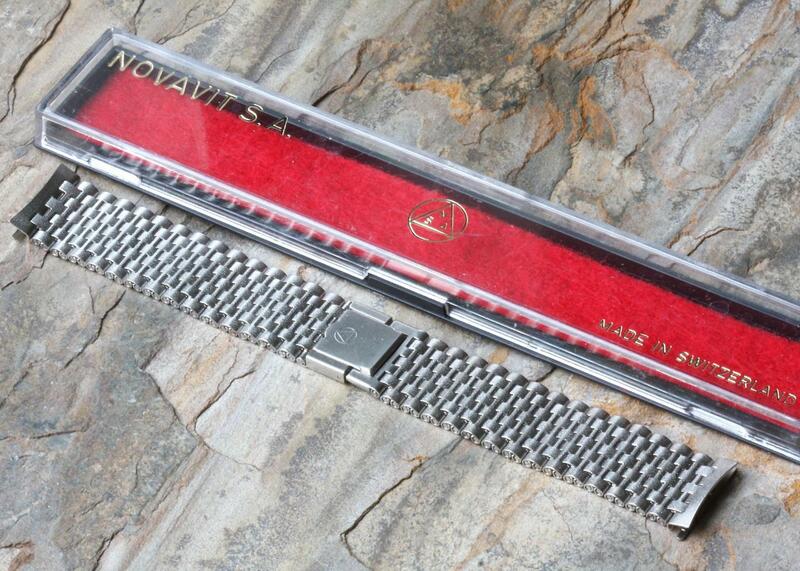 Available with either the long long standard deployant clasp or NSA’s 2-piece square clasp. Can come with 18mm, 19mm or 20mm straight ends or standard curved 18mm ends. 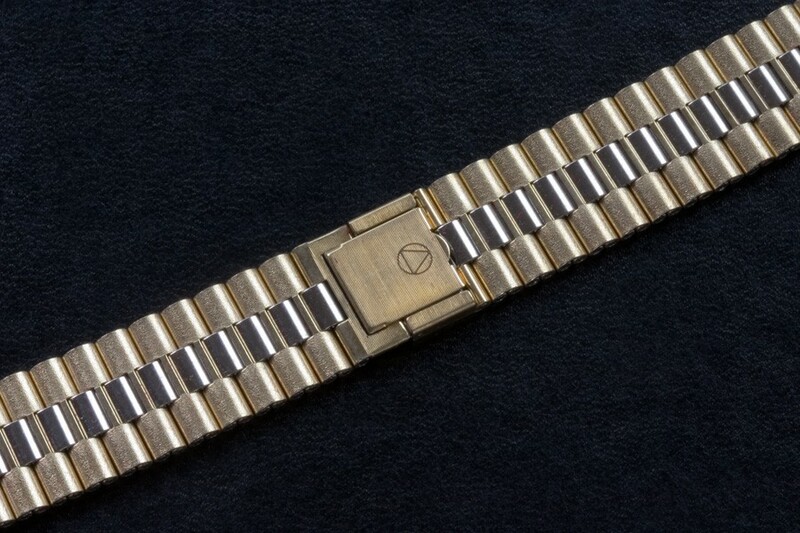 A 7 1/2-inch long (19.2mm) version of the band above, the NSA model Heuer and Jaeger-Lecoultre put on many watches. 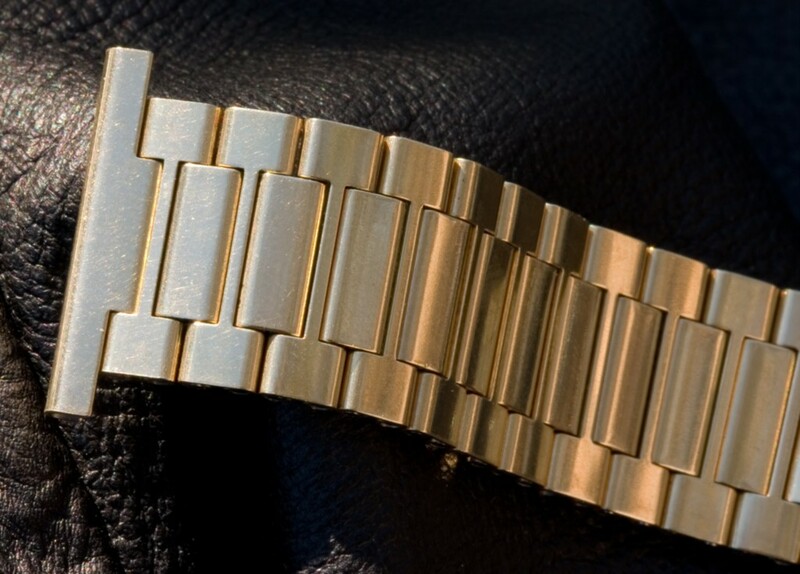 Has 18mm curved ends to fit dress and chronograph models. 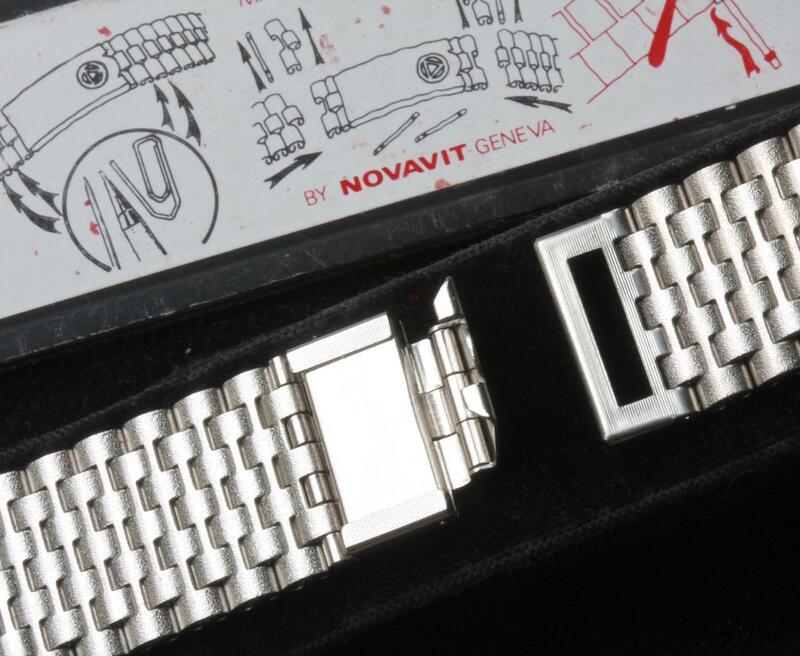 Alternating bark and beads links pattern used often by Movado and Zenith original NSA bracelets. 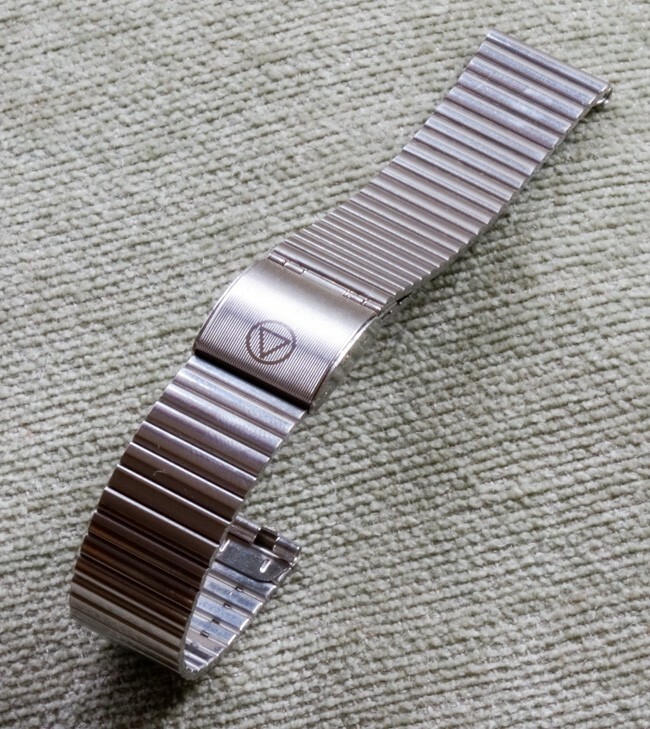 This steel style has the flat clasp opens the bracelet up to two pieces, great for extra comfort, easier removal and for flat display/storage of a bracelet watch. 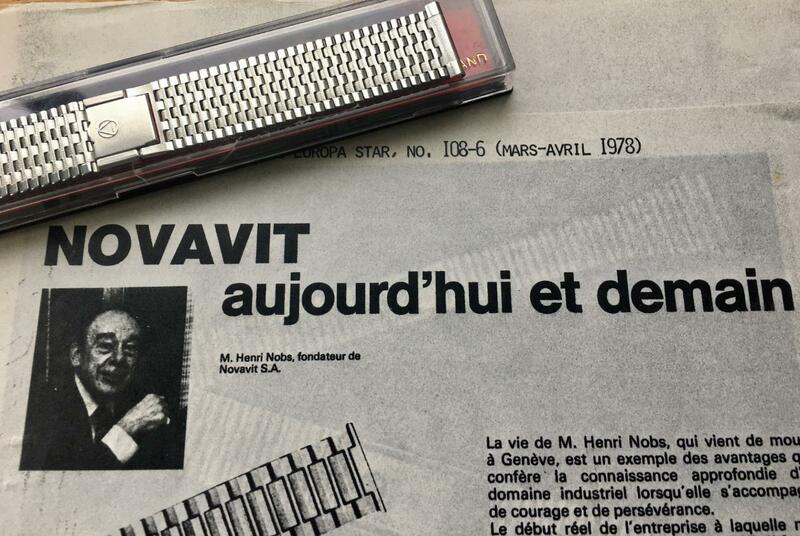 This model is known as the "Monaco" style because it came on early Heuer Monacos. Comes with straight 18mm, 19mm or 20mm ends. 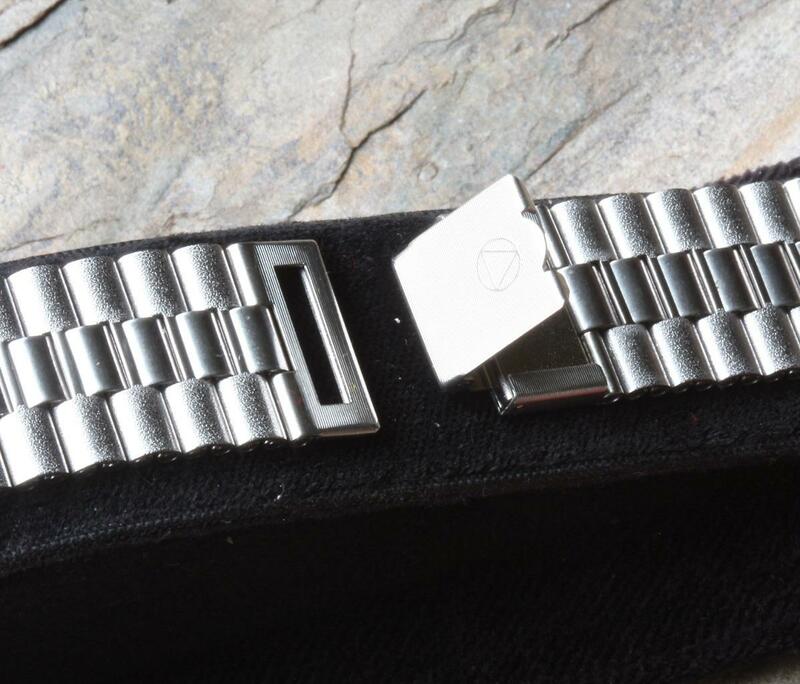 Super rare bracelet for Movado Datron chronographs. With the large Movado tophat logo. Comes with straight 18mm, 19mm or 20mm ends (as shown). 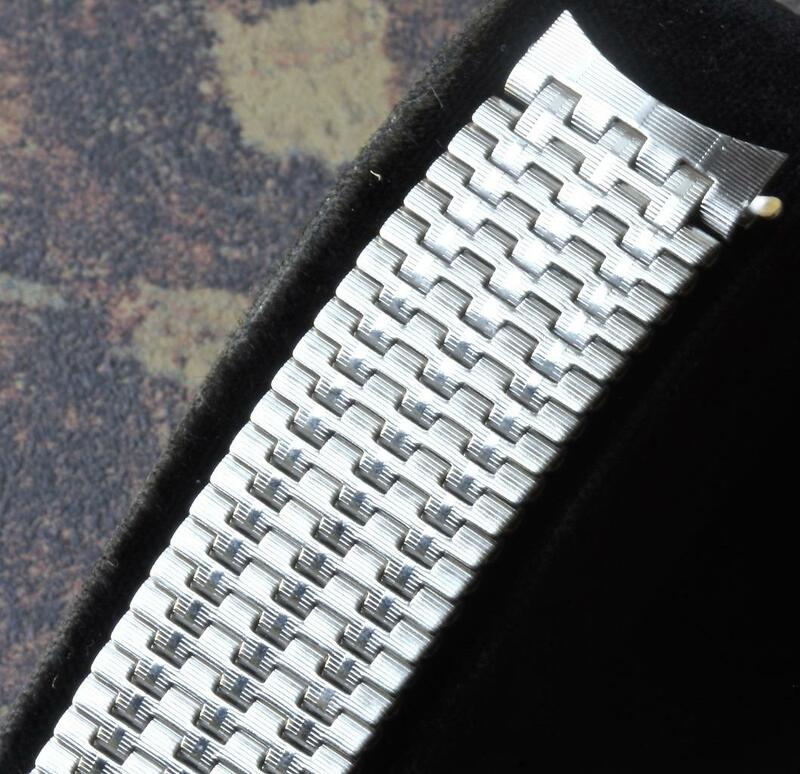 A rare NSA style that can come with 18mm standard curved ends that carry the identical pattern over on the end pieces. 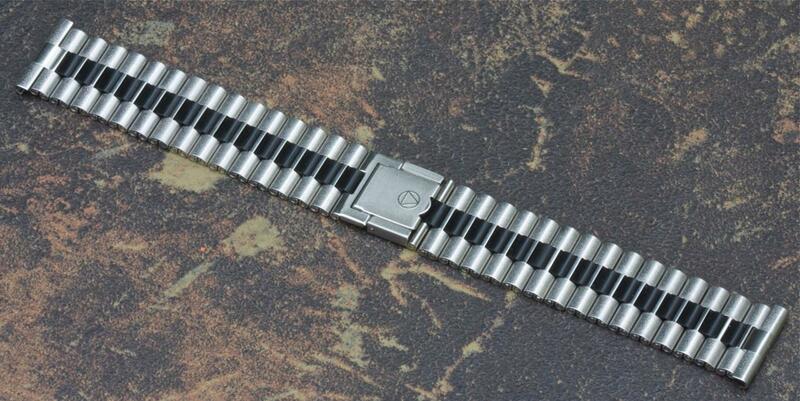 One of NSA's most popular bracelets for dive watches. Incredibly comfortable because of the tiny individual links, each of which flex when you wear it. Shown with 20mm straight ends, which we can modify to 18mm or 19mm at no cost. 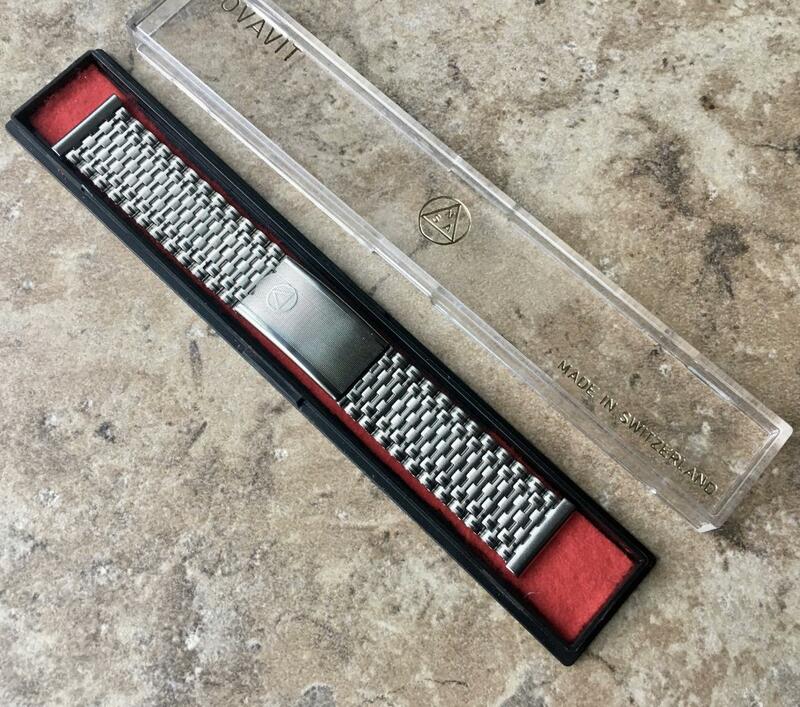 You get one set of ends, but can purchase a second set of ends to use this between different watches. 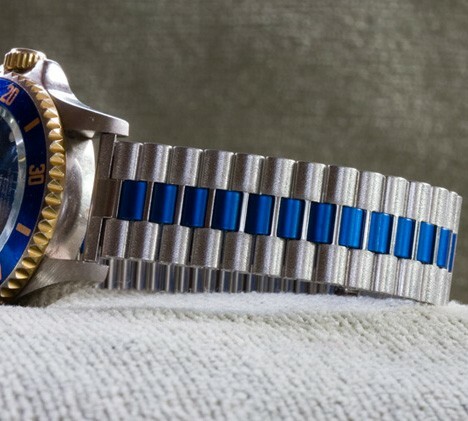 If you have a blue dial or blue bezel watch, what a bracelet to set it off. 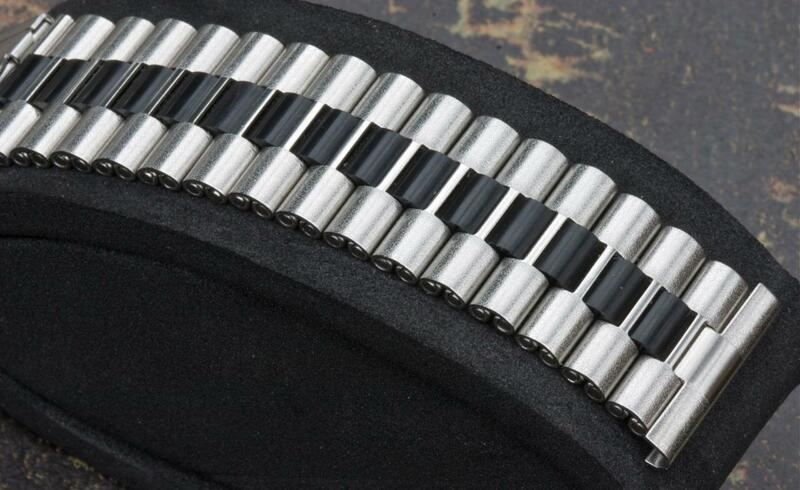 The steel links have a brushed finish. One of the most striking designs NSA ever offered. Can come with 18mm, 19mm or 20mm straight ends or standard curved 18mm ends shown. Great contrasting combination of brushed yellow gold links and polished steel center links. Comes with 18mm, 19mm or 20mm straight ends. 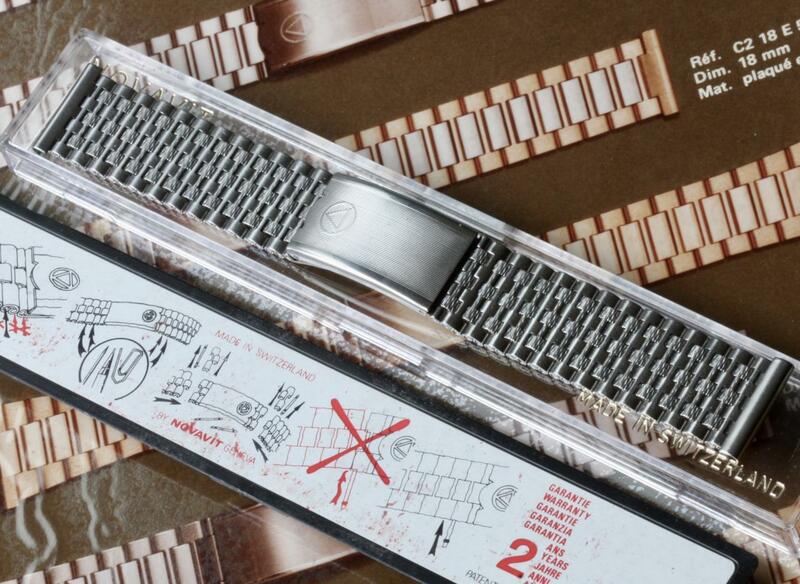 To strap those difficult 1970s C-shaped watch cases with the light-arc curve. Last of these rare ends sets that will work on many of those watches. 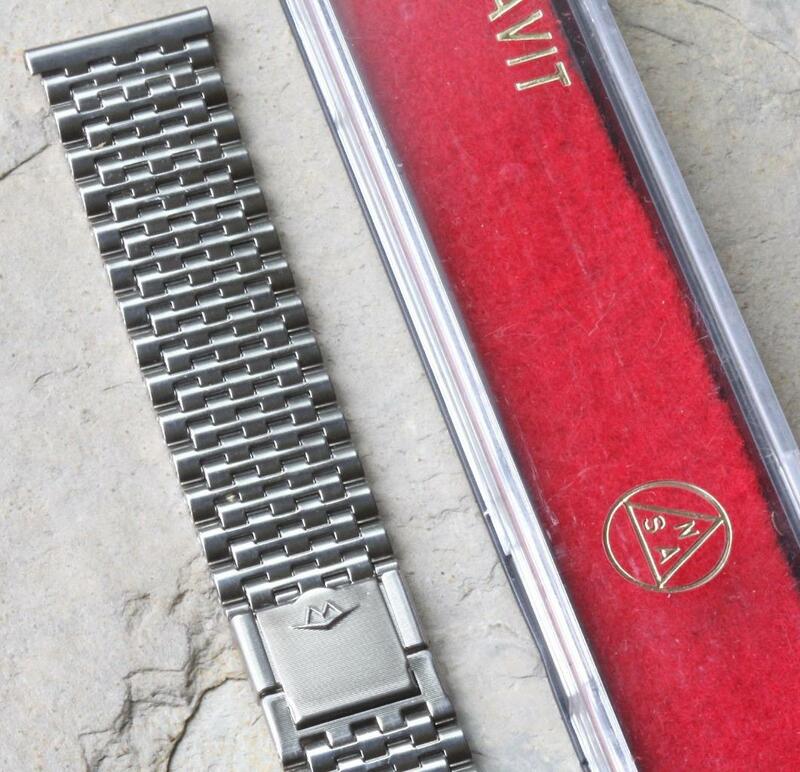 The band has a satin finish to the 7-row links design and is shown with the 2-pc clasp or it can come with a standard long deployant clasp. Elegant and popular flat brick link pattern. 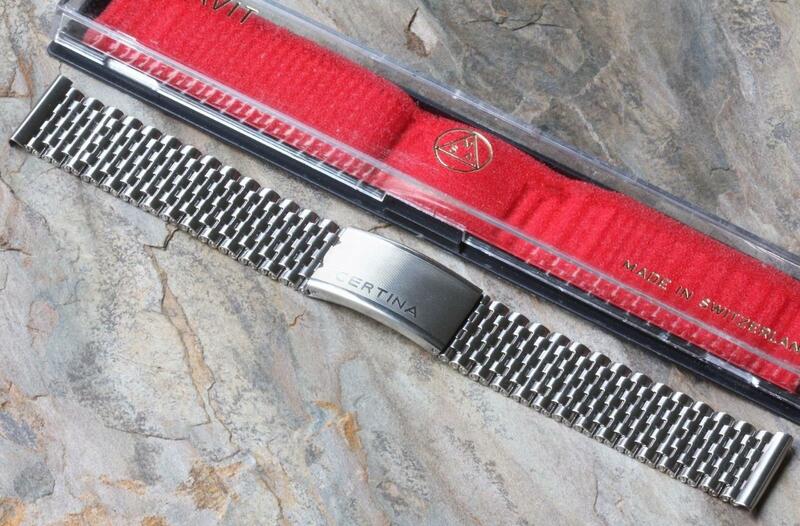 One of the few NSA bands that can come with straight ends in sizes 18mm, 19mm, 20mm, 21mm, 22mm, 23mm or 24mm. 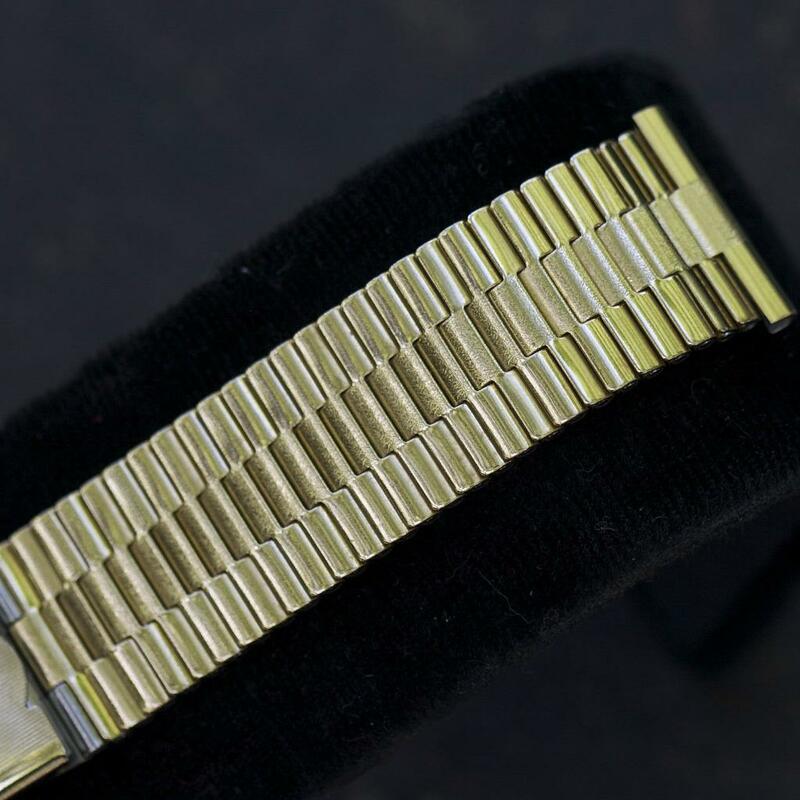 Great contrasting combination of polished smooth outer rows of yellow gold links and textured center rows. Comes with straight ends in sizes 18mm, 19mm or 20mm. 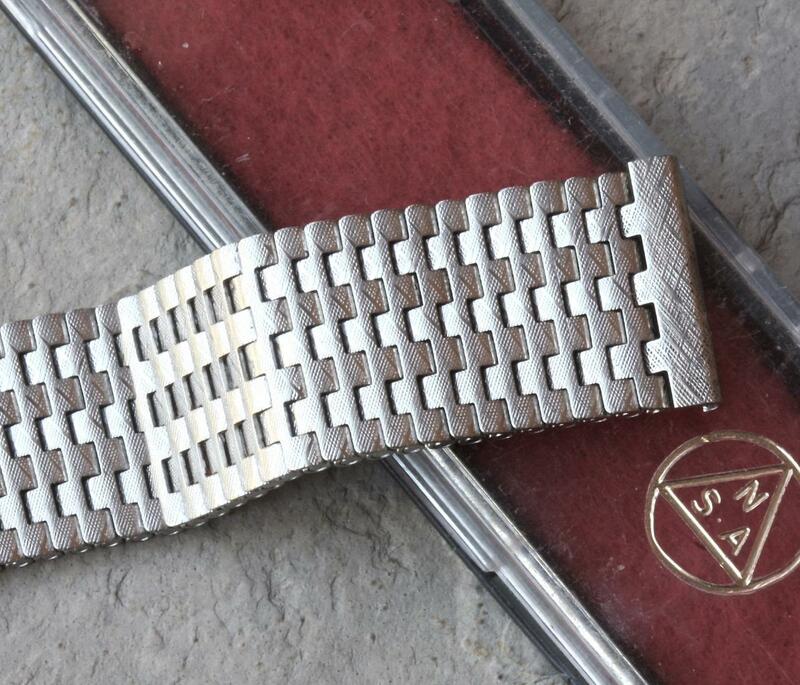 Very scarce stainless steel NSA links pattern with the unusual grooves. 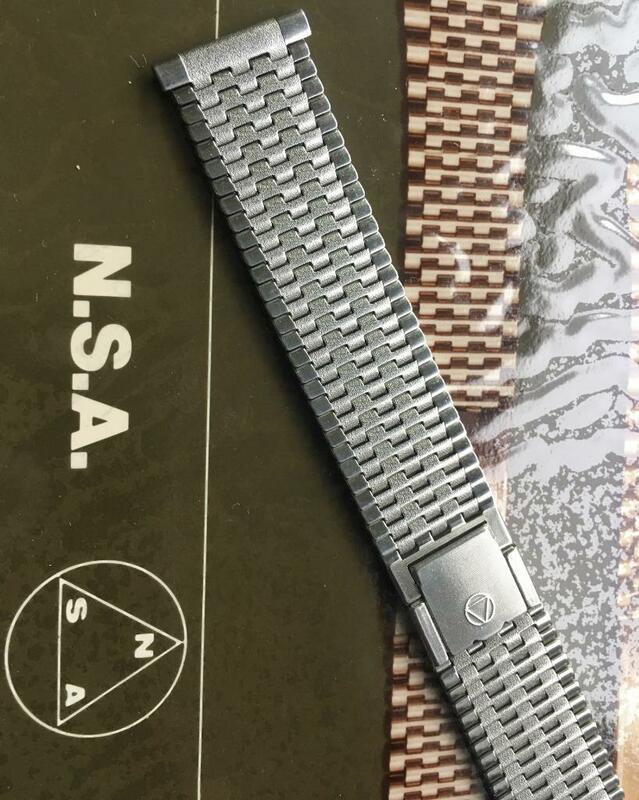 This style NSA band is similar to what appeared on Roamer Stingray chronographs models and Roamer Pasadena chronograph watches, plus some Breitling models. Can some with 18mm, 19mm or 20mm straight ends. 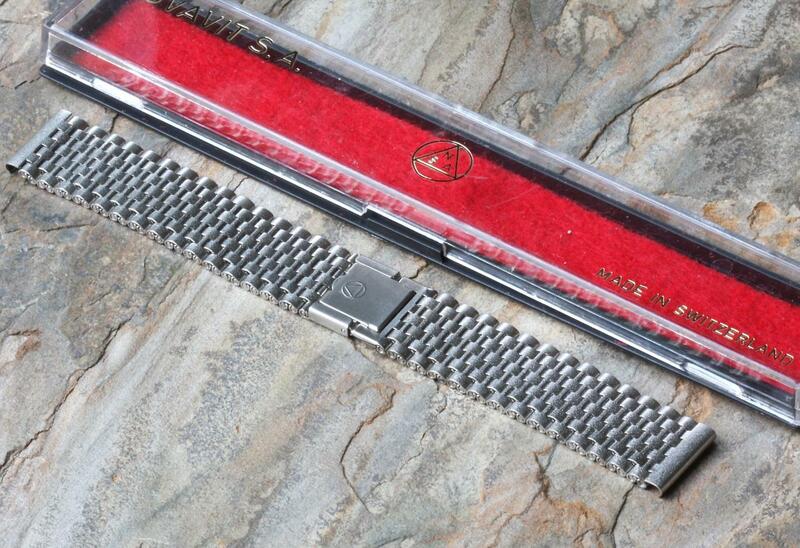 Please note this band is 5 5/8 inches (14.3cm) long. 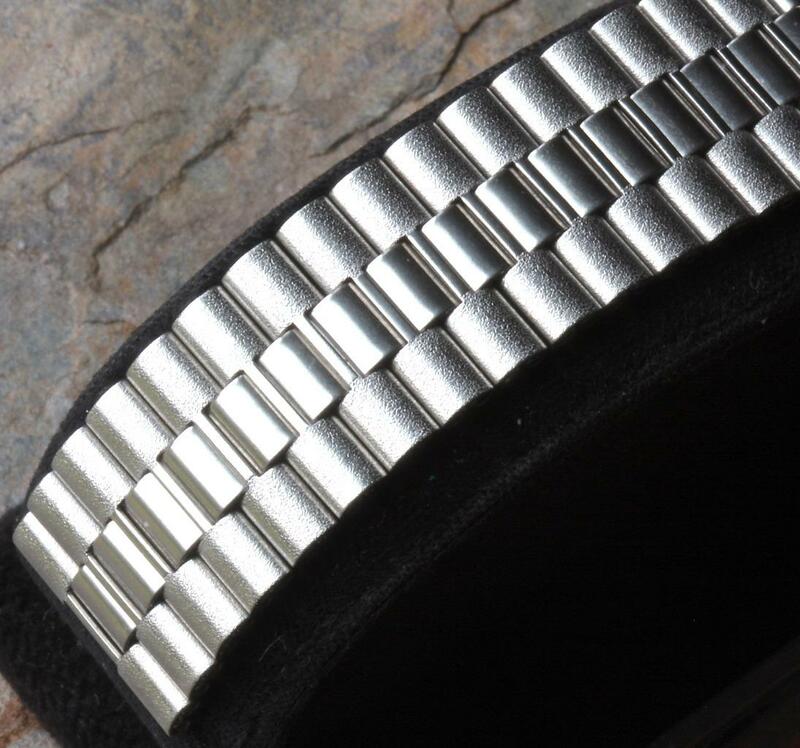 One of the rare NSA styles with small links in a satin finish to match a brushed 18mm, 19mm or 20mm lugs watch. Comes with the 2-pc clasp shown or you can request a long deployant clasp instead. 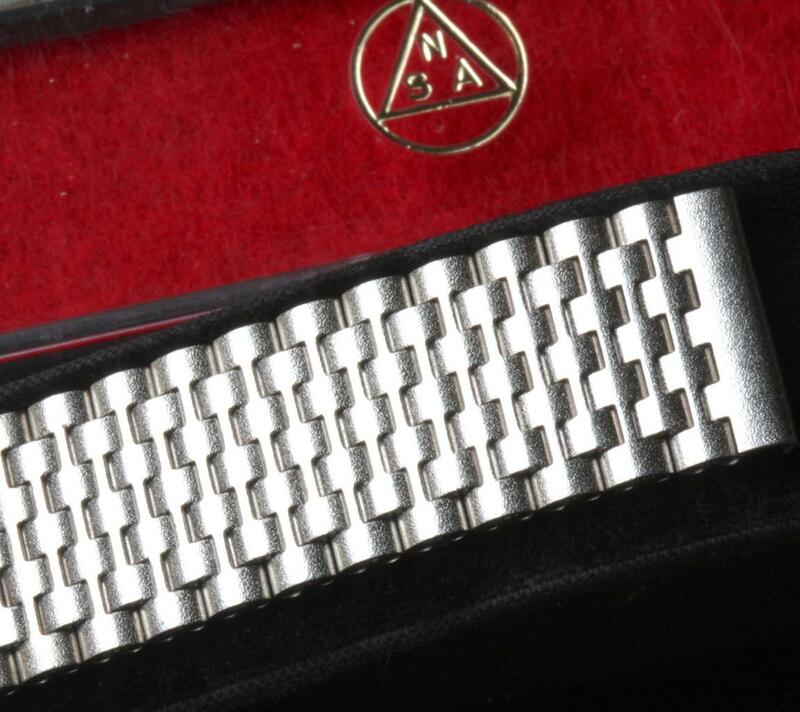 One of NSA’s most unique patterned links bands in stainless steel. 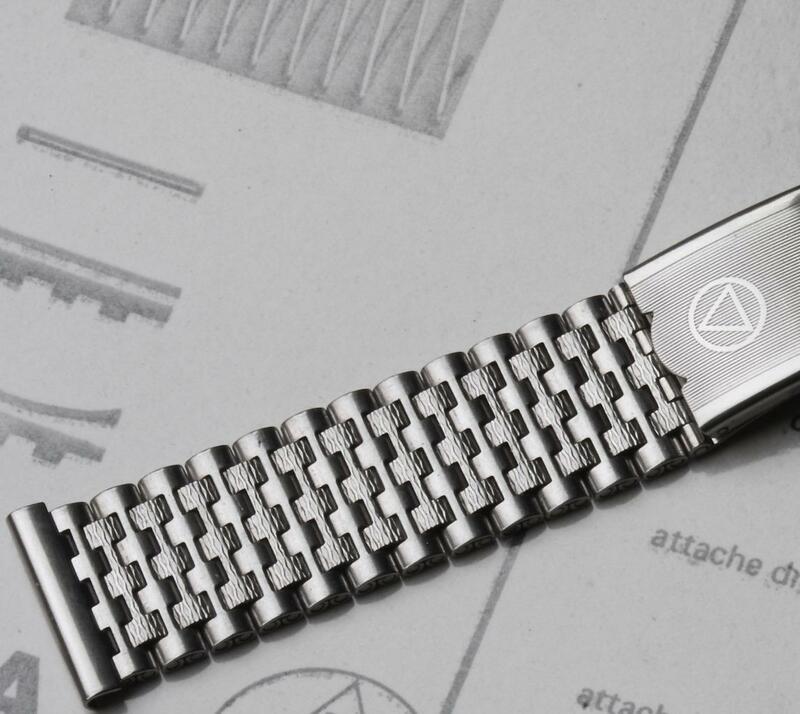 Tasteful yet stylish pattern will nicely accent the right watch with 18mm lugs. 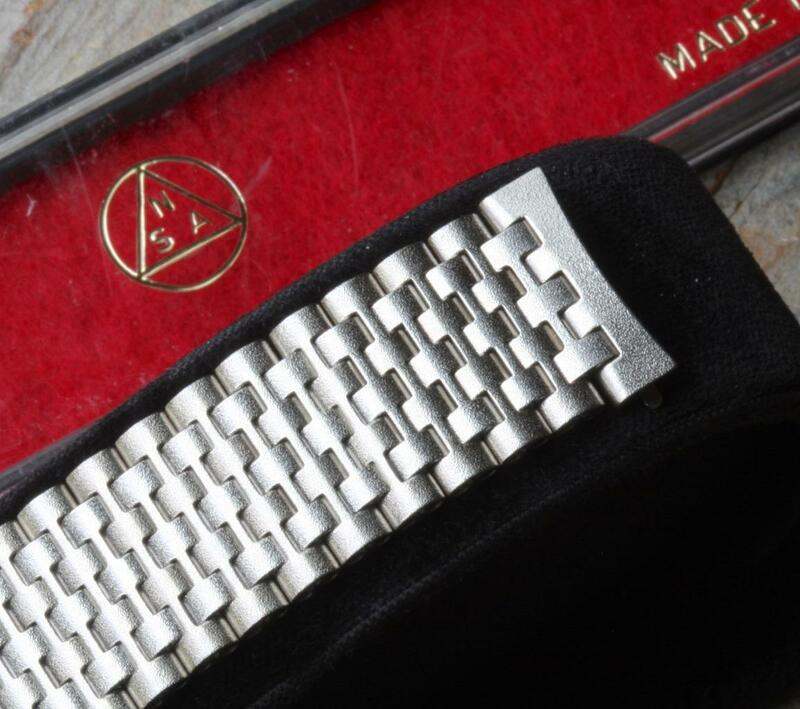 Standard flip-lock deployant clasp with CERTINA in large lettering. Perfect for chrono, diver or dress Certina model. Comes with straight 18mm, 19mm or 20mm ends. U.S. SHIPPING: ALL PRICES INCLUDE FREE U.S. DELIVERY VIA USPS FIRST CLASS WITH TRACKING. INTERNATIONAL BUYERS: Shipping is $70 via Express (arrives in 3-4 days in most countries) or $115 for FedEx. I have many references here over the past 10+ years.